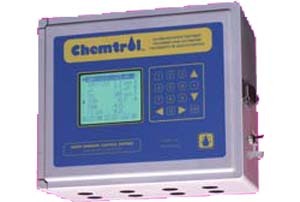 The Chemtrol PC3000 Controller is a programmable control system that offers complete chemical automation (ORP, PPM, and pH) plus control of conductivity or TDS, water balance with Langelier Index, temperature and heater control. Note: Programmable pump and filter control is available on the Chemtrol PC6000 Integrated Controller. The CHEMTROL PC3000 controller is a fully programmable controller that features automatic control of water chemistry, water balance, water saturation and heater, all with full remote duplex capability. The user-friendly Main Screen display enables the operator to supervise all the process functions at a glance and to quickly respond to any changing condition. The CHEMTROL PC3000 controller operates like a computer with full-screen displays and direct access to all menus and submenus. The front panel keypad is used to move up and down each menu and enter or exit the submenus. All operating functions can be easily modified from the keypad, including sensor calibration, control setpoints, alarm levels and the programs for super-chlorination, sequential backwashing, chemical saving and energy saving. With the Communications Package, any number of facilities can be monitored either by remote computer or by telephone. This allows real-time supervision by management and remote troubleshooting by factory technical support. The remote operation option features true duplex remote control by PC computer under Windows software, including background operation while running other programs. The voice telephone option includes status reports, operational control and automatic callout with voice message to up to three different phone numbers in case of emergency. Orders must be Pre-Paid by Visa, MasterCard, Discover, or Check in Advance. Prices are subject to change without notice. Prices are in US Dollars. All Sales are Final. Special Order items are non-returnable and non-refundable, and may require a deposit. Return Policy: Returned Items must have an Returned Goods Authorization Number (RGA) & may be subject to a 20% Restocking Fee. Volume & Special Pricing is Available. Email or Call 410-667-1177 to Confirm Prices. To Place an Order, Call us at (410) 667-1177 Mon-Fri, 9am-5pm EST, or Fax the order to (410) 667-1804 Fax. Email to custserv@ppciusa.com Fax Quote Desk 410-667-1804 Fax. Copyright 2002-2009 Parrish Pools Co., Inc. 117 Old Padonia Rd. Hunt Valley, Md. 21030 USA.